Zoo Boise is saddened to report that Jabari, the zoo’s 14-year old male lion, was euthanized Wednesday. In November, Jabari had been diagnosed with lymphoma. He had been undergoing treatment, including chemotherapy, since his diagnosis and while he appeared to be responding well, his condition declined recently. After another examination, it became clear that he had not been responding to treatment and with his condition worsening, the decision was made to euthanize him. Jabari arrived at Zoo Boise in 2008 along with the two female lions for the opening of the African Plains Exhibit. He has been one of zoo visitors’ favorites ever since, often roaring throughout the day. “Everyone at Zoo Boise is very sad about the passing of Jabari. He was part of our family and we will miss him. There is nothing quite like the roar of a grown male lion. Jabari provided that thrill to hundreds of thousands of people annually during his time at Zoo Boise.” said Steve Burns, Director of Zoo Boise. The median life expectancy for lions in zoos is 16 years. In the wild, female lions normally live 15-16 years; few males survive more than 10-12 years. 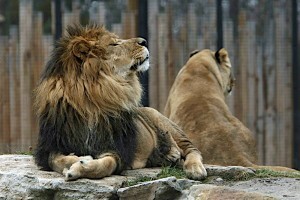 Zoo Boise still has two female lions, Mudiwa and Obadiah. There are no plans for the zoo to get another male lion. Both female lions are 15 years old and the zoo does not feel it would be prudent to introduce them to a new male. Mudiwa and Obadiah appear to be doing well according to the zoo’s veterinarian. Since 2010, the Zoo Boise Conservation Fund has supported the protection of wild lions in Africa through the Gorongosa Lion Project. Lion populations across Africa are threatened with the number of lions in the wild dropping from 400,000 to only 20,000 in the last two decades. Zoo Boise is accredited by the Association of Zoos & Aquariums, a national organization that supports excellence in animal care, conservation, education and science. Located in Julia Davis Park, Zoo Boise is open from 10a-5p. For more information, see www.zooboise.org or call 608-7760.